This was the best fun I’ve had in a long time… I was extremely nervous and full of self-doubt on the start line for this race; the lack of training and my trip to Egypt involving five days with no training had me on edge. Some might say that I had nothing to loose since I put nothing in. I believe though that once on the start line all those excuses mean nothing: once you put yourself on that start line there can be no excuses … it’s quite lame to do so. The whistle blew, or the bell rang, I was so nervous I don’t recall, and off we went for 10 pretty fast laps. The course was pretty technical – see image below – and the fact that there was no traffic made people take more risks than I’ve seen before. On three occasions I was behind a potential crash that was caused by stupidity and saved by a mixture of skill and luck. I started at the back of a bunch of around 90 riders and found the technical sections difficult, however, with each progressive lap I found good lines on some of the key corners and was gaining positions on these key corners. Skip forward ten laps and I did in fact try to make a gallop for the finish line; the home straight was probably 20 meters wide so technically there was no problem finding a path to the line. Unfortunately my 780w was not nearly enough to make an impression on some of the horses I was racing against. Results to follow but I’d say I finished top 1/3 or better and felt pretty good about that. Today as I sit here and type I feel my chest is pretty sore – 32 minutes of supra-max effort combined with no training has taken its toll. It remains to be seen if I will be able to race tomorrow. Seven laps of a 10km loop is the scheduled race – a race that will surely expose my lack of time on the bike… no faking that distance. After the race I managed to get ‘some’ training in. Then off to Egypt for 4 zero days. I’ll be sitting on the stat line of Arlanda Test Track tonight with 5 zero days in my legs. We will soon see if that is a formula for failure – it’s already pretty obvious that it’s not a formula for success! Bike race number 4 tonight. I started out feeling good and actually thought the first lap was too slow… I was thinking about asking my friend if we should have a go off the front on lap two but decided to sit tight instead. Lap three I lost patience and decided to give it a go on the small hill at the start finish; i didn’t get away but I did manage to string out the bunch in a straight line. Before that point it was getting a little crowded and chaotic. At the end of the third lap I found it very easy to position myself up the front and was in good position for the sprint… it seemed too easy I thought. After I took the turn off to the finish line I realized why gaining the front position was so easy: it was a four lap race and there was still a lap to go. I swung the bike around and chased hard and -probably my most proud achievement of the year- caught the bunch. This was hard… I very nearly didn’t manage it but I did. The next hill after I caught the bunch was also very hard but after that there was no problems at all. With the finish line actually approaching it became very difficult to make it up the bunch and but the tie the sprint came I was too boxed in to manage a real sprint. 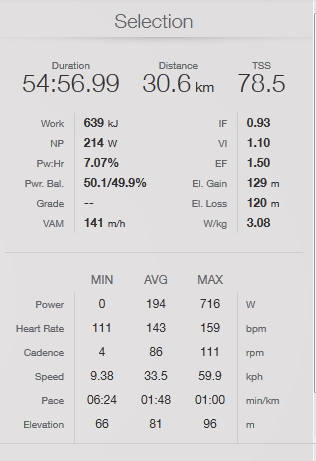 I was top 20 in the end and surprised to see the average speed was 40.4km/h. Good day. Good race. Very pleased. These days it’s all about cycling… I’m not running or swimming very much at all. Thursday I did a pretty good ride and made an attempt at ‘the lap’. 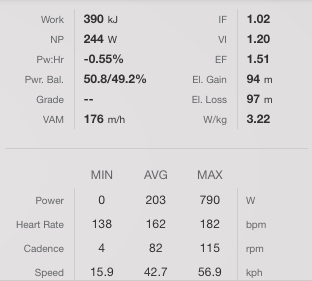 Two issues: I pressed stop instead of lap on my computer at the start so am missing data for the first 8km, secondly, I rode into a pretty strong headwind that died down by the time I hit the turnaround… the result is a slower than expected time. The above shows the part of the lap that I managed to record. 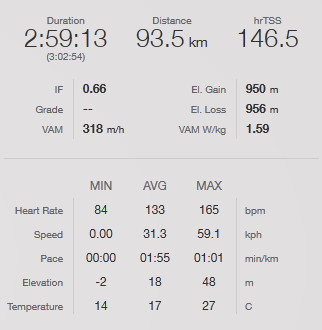 I backed up the ride the following day and hadn’t much left in the legs at all… 90 slow minutes of cycling. Rest on Saturday followed by a 40 minute run on Sunday. Today I’ll try to run… won’t be able to cycle. Left work with the intention of doing two easy hours on the bike. I felt flat from the day’s run so took a shorter long way home. 31 kilometers with some short sharp efforts. Another plan that didn’t work was today’s plan to do my premier in the NICK trail before work. Instead I opted to jump in the car and drive to work. Lazy day so far. Met up with R & J and went north of the city for a good training spin. There was no plan other than to just ride but we ended up doing three solid efforts during the three hours. I was happy afterwards and looking forward to backing it up with something on Sunday. Sunday came and I felt tired – really tired. Initially, in a state of denial, I postponed my training until after lunch, then after dinner and finally until after the kids went to bed… the final result was a rest day. Today I took my bike to work and plan to do two hours on the way home from work. I’ve already done 50 minutes training today: 40 fairly tough minutes on the treadmill and 10 minutes swimming. The treadmill run was 13,1km/h @ 1% with a few ‘jump ups’ in difficulty. Some 9% gradients without slowing down and a few 17,1km/h (3:30/km) bursts of speed. The goal is to get_back_running this week and keep building the load on the bike… a third goal is to get to swimming with the club. see how the week pans out. Tough race last night. A tough and technical course made holding the elite group impossible for me… my fitness also played a significant part in that failure. Nonetheless, I finished in the second group – a good strong group and even took a few pulls on the front. There was a short sharp hill that was a 90-95% effort each time and two slow corners; one 180 degrees and one over 90 degrees – both these corners were more difficult to me than the hill. I had to sprint for 100m out of each of them to catch/hold the group. This was hard but felt OK until it wasn’t. All felt good – there were good times and bad times but at one point, sprinting out of the 180 degree turn the legs went… For the first time in the race I felt that I would not be able to hang on until the end. At this stage I took the one and only look at my computer; it read 42 minutes as we powered up the long drag to the finish line. This meant that we had 4 laps to go (the race was planned to be 45 min + 3 laps). The next time into the climb I was positioned badly and I also took a bad line cornering into the climb… I had to dig deep up the climb and even deeper to catch the elasticated back of the group. In my mind I let myself be dropped then but the bunch compressed, the speed stabilized and I caught back on before. Next time lap I planned to hit the climb first in the group. I did so and found it much easier. The second last lap I nearly lost the group once more on the spring out of the corner but apart from that all went well. The sprint to the finish was a joke… I shouldn’t have contested it but I couldn’t help myself… my mind wants what the body can’t give it. Great night. Hard race. Can’t wait until the next one. From no bike racing in years to three races in two weeks (and two this week). I’ve been bitten by the bug… bitten hard. I’m doing my second SMACK series race tonight. I’m told that the course is technical with a 180 degree turn, a narrow bike path and a steep short climb. I want to finish in the main pack. What the main pack is will depend on who turns up to the race. There could be 100 people. The splintered groups off the back that will be lapped. Perhaps the name ‘main group’ is incorrect – but I’ve made clear my definition and expectations. Maybe. I’m only basing it on the fact that I was comfortable last race after 22 minutes – when I punctured… I really don’t know that I would have lasted the distance. Saturday’s MTB race gave me more confidence. We were going HARD up every hill (1000m ascent in 2:39) and I felt good in all hills for over two hours. 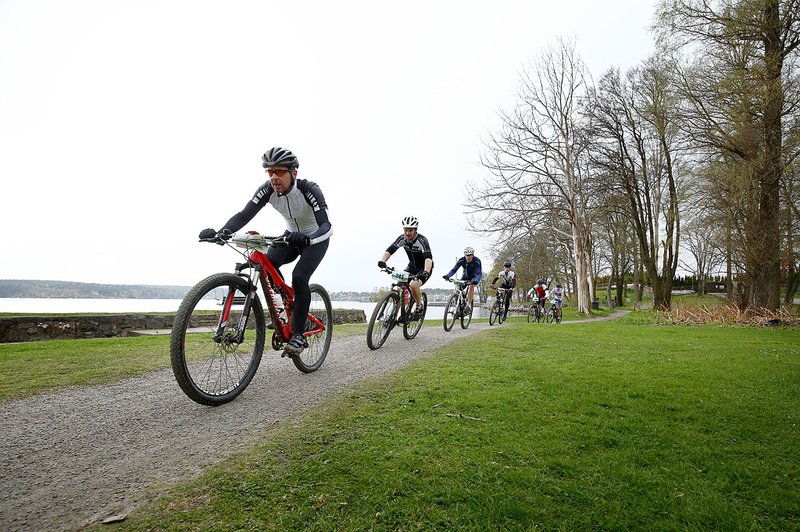 150502 Lidingöloppet MTB den 02 maj 2015 i Norrköping. I surprised myself today. Lidingö MTB race went pretty well and once again I outperformed my training performances by quite a margin. Having visited the course three times in the weeks leading up to the race, riding around the course mod-hard @ 18,1km/h average speed, I firmly believed that I would not be able to go under three hours for the race. This belief was accompanied by the HOPE that I would go under three hours. Knowing the difference between belief and hope I was pretty unmotivated and not at all nervous on the start line. The gun went and off I rode. The first section 1,5km on the main road up a minor incline before turning off the road and onto the gravel paths – that’s when the rolling hills started. I was with the front group of about 10 riders after the turn-off and held with them for a few kilometers. I honestly can’t say if I was dropped or if I just dropped off; I do know that I internalized the fact that I was going way too deep on the climbs and that the pace would be unsustainable… I just don’t know if I made a decision based on that or if my legs decided for me. Adrenalin was flowing and what happened happened. I was all alone for quite some time before a small group of four riders caught me… this became my group for the remainder of the race. We grew and shrank in size as the race progressed but there were five of us there the whole time. Until I did something by accident. Hills came and went and my fear of loosing my legs never materialized. Each climb I started mid-pack and finished at the front, I was climbing well and feeling good. Finally having confidence I decided that the group was going a little too slow on a flat section and I took a pull on the front. I increased the pace a little and the group happily sat on my back wheel. We then turned off the path and began a climb of about 30m from the coast back up to a main trail. I thought I hit this as hard as the other climbs but I also remember being afraid of being passed and dropped after doing my pull on the front before the hill. This may have made me go harder than usual. When I got to the top of the climb and moved aside to let someone else through I discovered that there was nobody to let through, I’d dropped them all. Very shortly after this I started to feel dead on the climbs and, with 10km to go, I believed that my legs had died. I battled on, kept turning the pedals and headed to the finish line waiting for the masses to pass me by. I did make the finish but the strange thing is that I never saw that group again – nobody passed me. Either they died a worse death than me or my feelings did not match my actual performance. Happy with the result: 2:39 and some seconds.